When you want to frame that beautiful face or special moment so that you can just glance up and see it whenever you want and smile at the memory, you need the very best quality inkjet cartridge to capture all the depth of colour and emotion. 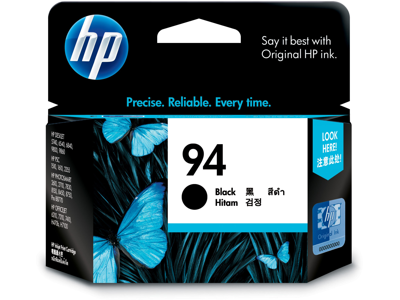 Using a genuine HP 94 (C8765WA) Black Ink Cartridge will always ensure that you get the quality you expect. Order your Black Ink Cartridges from CartridgesDirect for prompt delivery. CartridgesDirect – we work harder to make your printing easier. Print laser-quality black text and graphics with HP Vivera inks. This cartridge is designed for superior reliability and ease of use. Plus, when used with HP printers, it provides proactive low ink alerts. Used with HP printers, the Smart technology2 in this genuine HP cartridge provides proactive alerts to notify you when ink levels are low. A pop-up screen will appear on your monitor or you can check ink levels any time using your printer toolbox. footnote1 Based on paper industry predictions for acid-free papers and Original HP inks; colorant stability data at room temperature based on similar systems tested as per ISO 11798 and ISO 18909.
footnote2 Using genuine HP supplies ensures availability of all HP printing features. footnote3 Tested in HP Deskjet 6540 Color Inkjet Printer. Approximate average based on ISO/IEC 24711 or HP testing methodology and continuous printing. Actual yield varies considerably based on content of printed pages and other factors. For details see http://www.hp.com/go/learnaboutsupplies. I have ordered items through CartridgesDirect on a number of occasions and have found that they are reliable and you receive the items very quickly. I have no problem referring them to others. Easy to order, delivered promptly in excellent condition could not ask for more.